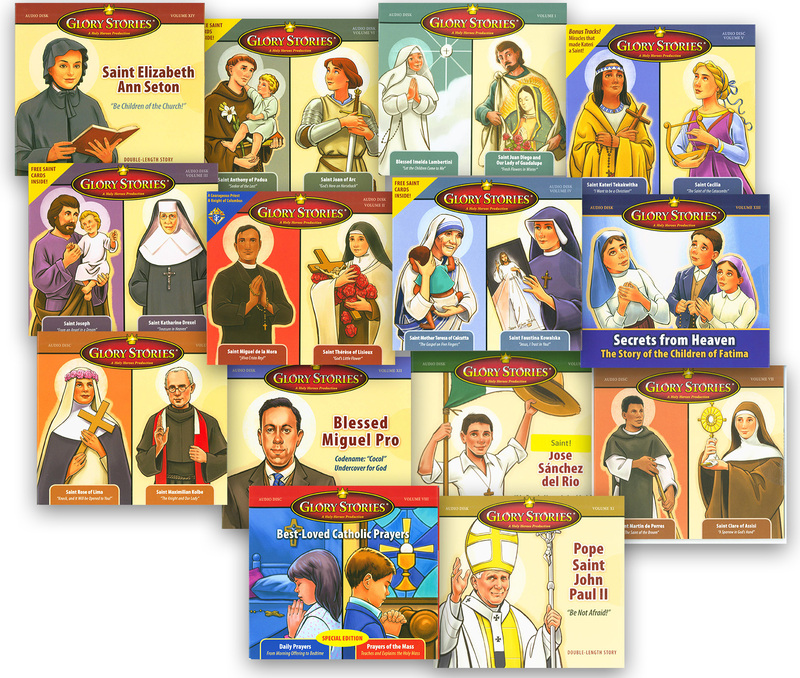 Set Includes: Blessed Imelda Lambertini (Patroness of First Communicants) and St. Juan Diego; Mother Teresa and St. Faustina Kowalska; St. Anthony of Padua and St. Joan of Arc; St. Rose of Lima and St. Maximilian Kolbe; Blessed Kateri Tekakwitha and St. Cecilia; St. Martin de Porres and St. Clare of Assisi; St. Miguel de la Mora and St. Therese of Lisieux; St. Joseph and St. Katharine Drexel; Blessed Jose Sanchez del Rio; Blessed John Paul II and Blessed Miguel Pro; Secrets from Heaven: The Story of the Children of Fatima; St. Elizabeth Ann Seton, our patroness; and the newest CD St. Bernadette Soubirous: Our Lady's Messanger. These professionally produced dramatizations are the true stories of the lives of holy people of God. Both children and adult saints set inspiring examples for youngsters to emulate in their early walk of Faith…and teach their parents at the same time! I bought these last year for my 7 and 10 year old boys to listen to in the car. They LOVE them! I rotate them so we listen to different stories about the saints, and they never get tired of listening to them. And neither do I :) I'm inspired by this collection of heroic Catholic men and women who devoted themselves to serving Christ daily. I can't say enough positive things about Holy Heroes cd's.